A new multi-million pound marketing initiative will launch on Sunday 16 September, as part of the partnership between RNIB and Specsavers, to encourage more people to prioritise their eye health. The campaign will continue throughout National Eye Health Week (24-30 September) and finishes on 30 September. 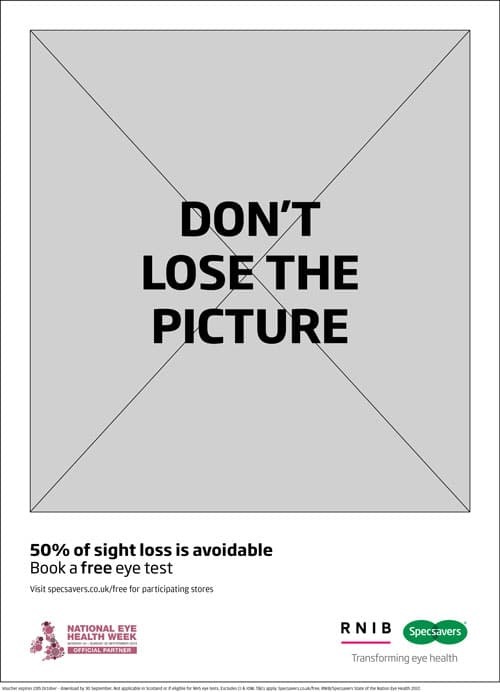 Supported by National Eye Health Week (Vision Matters) and the RNIB, the campaign encourages people who have never had an eye test before to do so and is rooted in RNIB research findings that 50% of sight loss is avoidable. The concept, conceived by Specsavers in-house creative team, is called ‘Don’t lose the picture’. 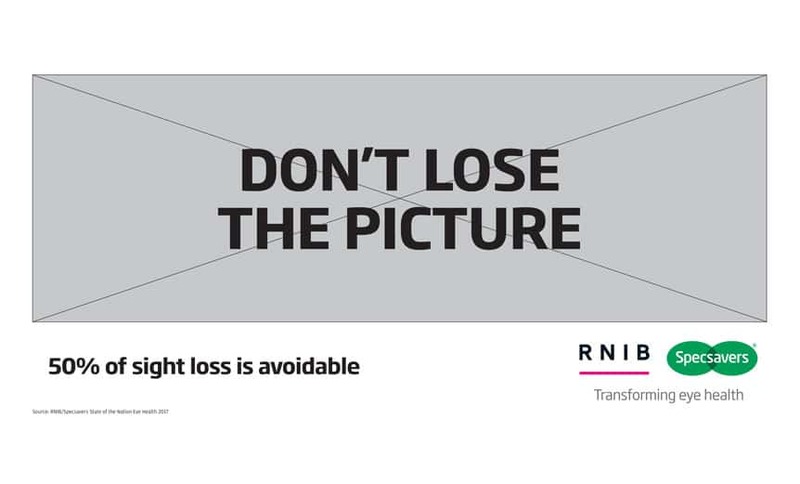 Advertising spots where consumers would normally expect to see a picture, will have ‘lost the picture’ and instead display the words ‘Don’t lose the picture. 50% of sight loss is avoidable. Book your eye test today‘. The TV advertising launching during ITV’s hit Vanity Fair reimagines Specsavers’ famous ‘Should’ve gone to Specsavers’ Collie ad with the visuals replaced by a written description in the brand’s witty, irreverent style. The power of the campaign will lie in the multiple creative executions including further TV spots, video on demand (VOD), billboards and digital advertising. Cinema advertising includes a one-off partnership with Sony Pictures where Specsavers will hijack the trailer of the upcoming Simon Pegg blockbuster Slaughterhouse Rulez, which will have had the ‘Don’t Lose the Picture’ treatment (showing only a written description). Other activity includes high-impact media partnerships in The Sun and Metro newspapers and sponsorship of an eye health supplement in The Sunday Times newspaper. Bringing the campaign to life on a one-to-one basis for shoppers, the RNIB Eye Pod will tour high streets and shopping centres. Customers can speak with a Specsavers optometrist, an RNIB representative, book an eye test and experience simulated sight loss in nationwide locations. Additionally a Twitter question and answer session with optometrists Dr Nigel Best and Sarah Marshall will run on 27 September, where consumers can have their eye health questions answered online, using the hashtag #EyeHealthMatters. According to the All-Party Parliamentary Group (APPG) on Eye Health and Visual Impairment’s See the Light report, which determined that more needs to be done to make eye health a priority, the number of people in the UK that will be affected by sight loss is predicted to increase by more than 10% by 2020 rising to more than 40% by 2030. Free eye tests will be available nationwide at participating Specsavers stores between 17 and 29 September, redeemable for two weeks in October.